We will get together in high elegance and style. Protected content is an incredible Italian Restaurant located in the mansion that once belonged to the designer Balenciaga. The decor is absolutely gorgeous and the food is also. 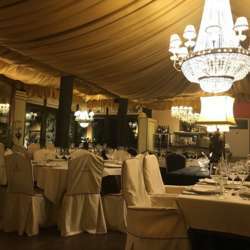 This restaurant is close to my house and I pass it often and I thought that it would be very expensive but they have a beautiful lunch for 18 euros. When I ordered it I got a first course, 3 different plates of pasta, a small second course, desert, and something to drink. So polish your shoes, or wear something special and come join us.